March is usually a sleepy month for video games. Most big-name titles hit the market during the holiday season, and the excitement surrounding E3 doesn't happen until June. The spring is like purgatory for gamers. But yesterday, Steam bested a record that was set back in January: roughly 9.07 million users logged on simultaneously (thanks, VG247). This is the third time that Steam users have broken the record within the last few months. On December 28th, 8.36 million users logged into the service, evidently trying their new Christmas gifts. 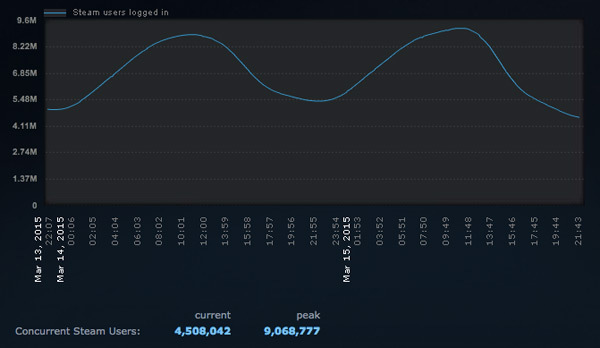 And four days later, on January 1st, the record was broken again, with 8.47 million users. Record-breaking numbers like these aren't surprising during the holidays, but the fact that yesterday's achievement happened in the middle of March will probably raise a few eyebrows. Even though Valve's new hardware projects haven't hit the market yet, Steam's user base is surging. And, with very few exceptions, PC gamers are attracted to a very different library of games than console users. A quick perusal of the top items on today's chart-busting list should be enough to send a nervous shiver down the spines of big-name publishers like Electronic Arts and Activision. The top three titles on that list were published by Valve, which means they're not really meant for console gamers. Team Fortress 2 and Counter-Strike: Global Offensive are both available on the Xbox 360 and PlayStation 3, but that's not where they shine. Civilization V and Garry's Mod, on the other hand, aren't even available outside of the PC ecosystem. So, that's a fan base that will never be tapped by console-centric publishers. SEGA's Football Manager 2015 had 66,000 users today, but the title doesn't appear on any major console (though, it's inexplicably available for the PlayStation Vita). In fact, Football Manager is probably part of the reason why SEGA is scaling back its console development in favor of PC and mobile titles. According to developer Starbreeze, PayDay 2 was so popular that it turned a profit six days before it was even launched. And the PC edition continues to be the definitive version. However, my favorite set of numbers belongs to Cities: Skylines. This game was only released a few days ago, but it's gone from being relatively obscure to being one of the biggest games on the market. Electronic Arts should be very jealous, considering it's just an updated version of the classic SimCity titles. The next twelve months could get very interesting. Steam's popularity continues to climb, and a large percentage of gamers haven't upgraded their consoles to an Xbox One or PlayStation 4. So, when Valve's Steam Machines finally hit the market, along with the Vive and Steam Link, we might see a slew of console gamers migrating to the PC. And if Valve ever announces Half-Life 3, the record-setting days will start to pile up.